A popular East Coast vacation destination, Newport, RI is home to beautiful Gilded Age mansions and many great places to stay. Plan a weekend trip to one of these unique hotels, lodges and inns where you can rejuvenate with spa treatments, taste great food and go on romantic walks with a view. Here are the best places to stay in Newport, Rhode Island. 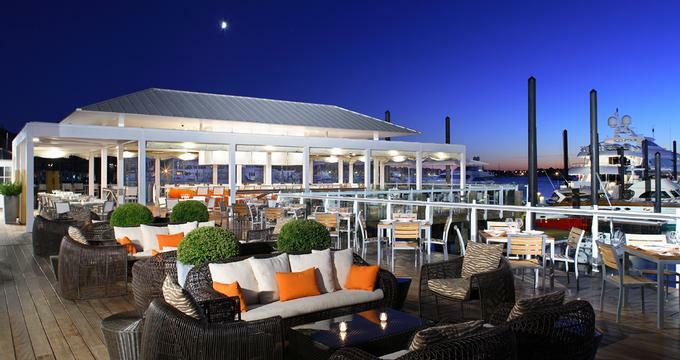 Featuring modern contemporary furnishings and décor, the Forty 1 North Hotel is an elegant marina resort and one of the best hotels in Newport RI. Overlooking the water, the property has direct access to the docks and marina, and it provides a coastal atmosphere of adventure, beauty, and opportunities for rejuvenation. The Forty 1 North has 28 deluxe suites and rooms featuring large floor to ceiling windows with spectacular views, cozy contemporary furnishings, private fireplaces, and state of the art technology, features that will allow you to forget your worries and make the most of your stay. Just steps away from your room, you can find quite a few tempting dining options, including Christie’s, which serves flavorful burgers, and The Grill, an exclusive dockside restaurant. 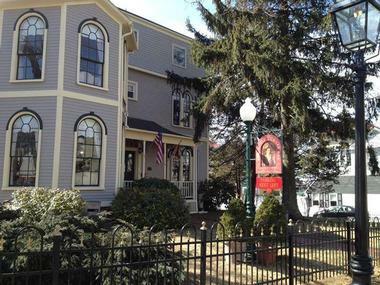 Located in the heart of Newport, the Attwater provides a traditional bed and breakfast experience with an inviting ambience that will completely draw you in. 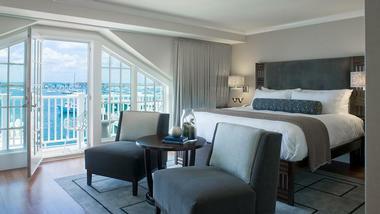 The Attwater offers 17 nautically designed deluxe rooms and suites filled with modern amenities. With an Apple TV, iPod Docking stations, and a Kuerig coffee maker, you will feel at home during your stay. Each morning, the Breakfast Café provides you with a delectable selection of baked goods, granola, and baked egg dishes. With amazing sailing opportunities, beautiful beaches, and a variety of world-class festivals that take place throughout the year, you might even book your return trip before you leave. 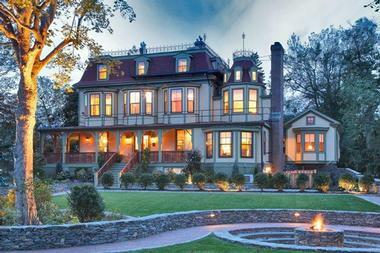 The Ivy Lodge is located off Bellevue Avenue in the historic mansion district of Newport. The opulent rooms of the lodge are beautifully decorated with time period antiques, giving the establishment an air of authenticity. With eight thoughtfully decorated rooms, the lodge, built in the late 19th century, has elegant furnishings that will allow you to feel comfortable and sophisticated throughout your relaxing stay. The Satterlee Family Suite is perfect for a family of four, and it is also ideal for an evening of snuggling next to the fireplace. You can feel the rich history and tradition the moment you enter the Vanderbilt Grace, a historic boutique hotel located in Newport. During your stay at this restored mansion built in 1909, you can enjoy swimming in the indoor pool or relaxing in the beautifully maintained gardens. The concierge services and hotel staff are dedicated to meeting all your needs. Luxury accommodations at the Vanderbilt Grace range from deluxe rooms to one and two bedroom suites that include charming kitchenettes, minibars, flat screen TV’s, and Wi-Fi access. Visit the fitness center for a great workout and then head to the spa for one of its many rejuvenating treatments. There are five restaurants at this establishment, including the spectacular roof bar where you can enjoy a perfect Newport sunset. 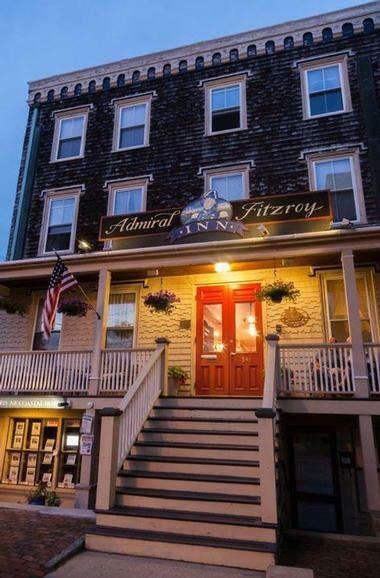 Located in the center of Newport, the Admiral Fitzroy Inn was originally built in 1854. Today, it is a historic Bed and Breakfast with staff members who will attend to your every need and make you feel at home. 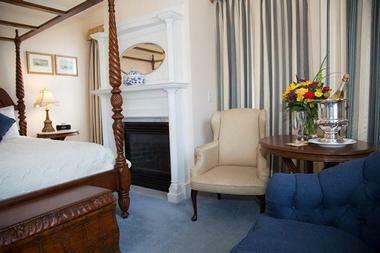 The Inn has complimentary parking and offers a classic bed and breakfast experience. 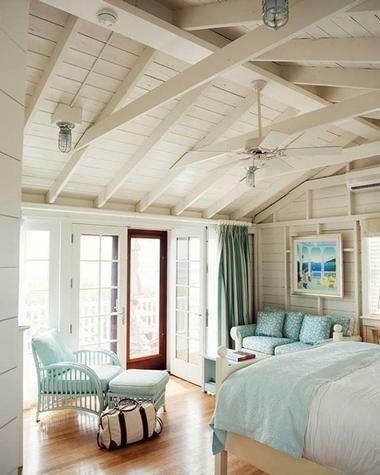 There are eighteen elegantly designed rooms that feature tasteful splashes of color. All the rooms are comfortable, and staying here you will leave you feeling relaxed and refreshed. Room amenities include cable TV, Internet access, and a small refrigerator. Start each day with a delightful continental breakfast served in the sunny breakfast room. You are more than welcome to sit in a comfortable chair on the rooftop deck and unwind after spending an afternoon browsing Newport shops or playing at the beach. 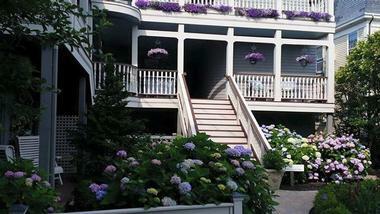 The Cliffside Inn provides a memorable getaways located steps away from Cliff Walk. This gorgeous and traditional bed and breakfast is an excellent destination for a romantic getaway, family trip, or an escape with friends. Accommodations consist of rooms in a Victorian Mansion and the Sea View Cottages, which are dog friendly. Each room features elegant Victorian furnishings and decor to create a welcoming atmosphere of sophistication. The truly delectable dining options available at the inn are particularly popular with guests. Enjoy your meal in a classic Victorian parlor or on the veranda. Each day begins with a mouthwatering multi-course breakfast, and you can also take advantage of afternoon hors d’oeuvres and wine or a late night treat around the fire pit. La Farge Perry House is situated in an ideal location that simultaneously offers tranquil seclusion and access to all the nearby excitement. This historic estate surrounded by colorful gardens has a welcoming front porch with inviting wooden rocking chairs perfect for relaxing after a busy day of fun-filled activities. 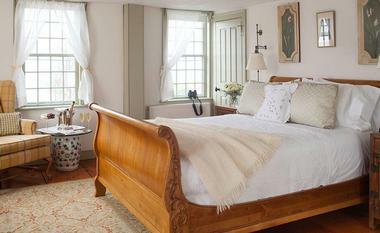 Furnished with period antiques, this bed and breakfast is a tasteful blend of grandeur and charm. The attentive staff provides world-class service, and you will feel pampered throughout your stay. Each morning starts with a sinfully delicious gourmet breakfast served in the dining room. After a day filled with shopping, beach activities, friendly tennis matches, or sailing, you can return to spend a pleasant evening of wine and cheese in the parlor. The Castle Hill Inn offers direct access to a private beach. During your stay at this stunning 40-acre estate, you can take in incredible ocean views or spend time on the beach sitting on comfortable chairs. The Castle features 35 spacious rooms designed to capture the New England coastal feel, including deluxe suites, beach houses, the harbor house, and beach cottages. Modern amenities include a minibar, flat screen TV, charging station, Bluetooth enabled sound system, and plush robes. During your stay at this seaside oasis, you can dine on New England al fresco cuisine in the classic dining room or on the lawn, where you can enjoy the ocean view. This is a great location for weddings, romantic escapes, or family fun. 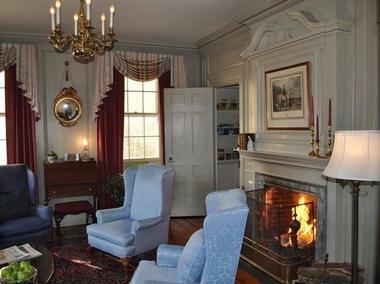 The Samuel Durfee House, a Federal Period Inn built in 1803, is conveniently located near shopping, entertainment, restaurants, and local yachting opportunities. Each room is warm and inviting with rugs covering the hardwood floors, mahogany furnishings, and all the comforts you need for a relaxing and pampering experience. Convenient amenities include iPod docking stations, refrigerators, and luxury toiletries. Mornings at the Samuel Durfee House begin with a delicious and filling breakfast served in the dining room. At the end of your magical day in Newport, you can enjoy fresh baked goods, fresh coffee, and hot tea prepared by the attentive staff. With easy access to fun, sun, and adventure, this bed and breakfast has everything you could want. The Captain Simeon Potter House offers a unique vacation experience, as it is an 18th century sea captain’s home replete with modern amenities. Each room is decorated with original artwork and period pieces to celebrate the rich history of the home. The establishment has four spacious chambers and suites that have hardwood floors, cozy poster beds, and every modern amenity you could need to indulge in rest and relaxation. Each morning you can savor a homemade breakfast with fresh farm-to-table options so delicious you will want to take a second helping. This traditional bed and breakfast is perfect for family reunions and romantic vacations. Centrally located in Newport, the Victorian Ladies Inn is conveniently situated near Cliff Walk, the Bellevue Ave district with its historic mansions, shopping opportunities, and popular restaurants. 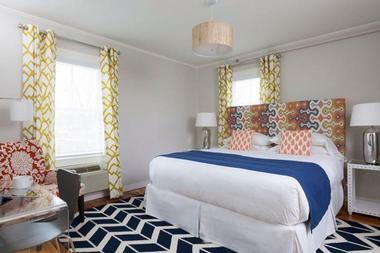 Built in the 19th century on America’s first gas-lit street, the inn is replete with both history and elegance. The Victorian Ladies Inn features guest rooms in three separate buildings, several of which feature private entrances, fireplaces, and mini decks. During your stay, you will enjoy a welcoming ambiance while being pampered in this classic and beloved estate. Start your morning by indulging in a truly delicious homemade breakfast featuring a hot and cold buffet. Complete your experience with afternoon tea, which attracts great company and provides guests with hot tea and delicious treats. The Marshall Slocum Inn is a beautiful and classic 1855 Victorian home filled with period antiques and artwork honoring its Colonial and nautical heritage. Throughout your stay, you can take advantage of modern conveniences and all the comforts the Inn has to offer. Spend a pleasant afternoon or evening relaxing in wicker rockers under the big copper beech tree out front. 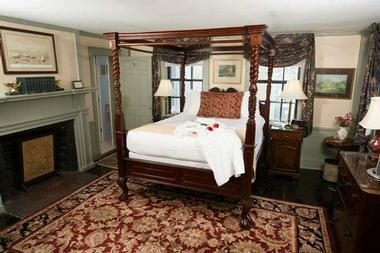 The inn has five classic Newport rooms with luxurious features like whirlpool bathtubs, a fireplace, and skylights, all of which provide a cozy atmosphere in which you can rest and recharge. A heavenly breakfast is prepared fresh daily, and some of the options may include sinfully amazing blueberry pancakes or banana stuffed French toast. You can enjoy your meal on the deck, in the dining room, or in your room for the true bed and breakfast experience. If you have ever wanted to combine a yachting experience with a traditional bed and breakfast stay, the 80-foot custom built Ocean Romance Bed and Breakfast Yacht is the place for you. You don’t even have to worry about seasickness, as you will not leave the dock during your stay. Choose between three comfortable staterooms, each with a private bathroom. 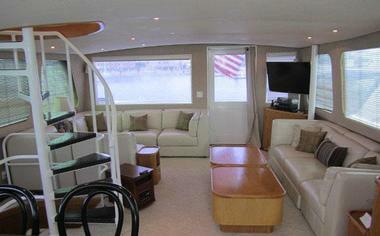 Cable TV is available, and the yacht is Wi-Fi accessible. You will be able to relax in pleasant common areas, a main salon, and on an outside deck with unforgettable picturesque views. When you wake up in the morning, you will not only see a glorious sunrise, but you will also enjoy a delicious gourmet continental breakfast buffet. 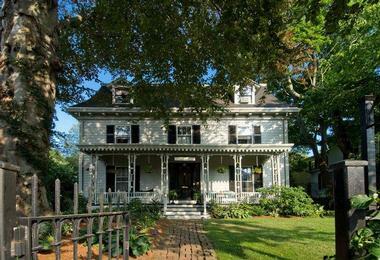 The Newport Blues Inn is a quaint bed and breakfast whose allure will have you enthralled. 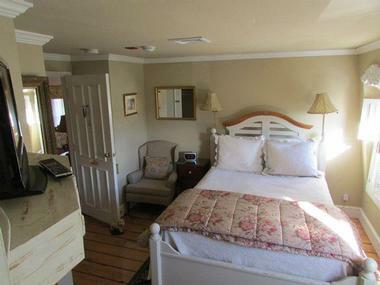 The Inn is close to charming shops, the historic mansion district, the marina, and cliffs walk. The Newport Blues Inn features twelve rooms including deluxe rooms, suites, and the penthouse, ideal for groups that want to have shared common spaces and private sleeping areas. Each room is warm and inviting, and they all provide modern conveniences such as cable TV, air conditioning, wireless Internet access, and plush bedding. Each morning a complimentary full meal is served in the cheerful breakfast room or on the garden patio. You can try scrumptious muffins, cereals, and a tasty hot dish. If you are looking for a classic Victorian getaway experience, the Almondy Bed and Breakfast is perfect for you. Built in the 1890’s, this remarkable building has been transformed into a luxury inn from where you can easily access all of the fun and adventure Newport has to offer. Featuring five guest rooms and suites decorated with period antiques pieces, classic furnishings, and a cozy fireplace, this establishment promises an intimate and luxurious experience. Each room includes a television, DVD players, free Wi-Fi, and comfortable robes perfect for lounging. A filling daily breakfast that features sinfully delicious homemade pastries is served in the dining room. Finish your day with a wine and cheese spread served in the parlor and take the time to unwind and connect with other guests. 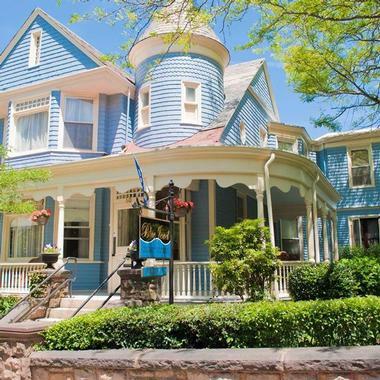 The Architect’s Inn is a great destination if you want to experience a Victorian bed and breakfast that will magically transport you back in time. 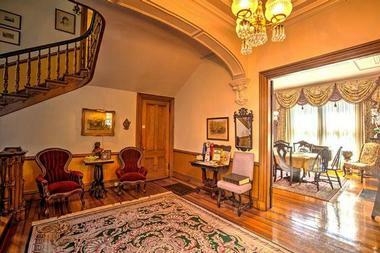 The mansion was built in 1873, and you will love the quaint furnishings and original pieces. With easy access to Newport and all of its adventures, this location is ideal for any traveller. With ten elegantly decorated rooms and suites featuring Victorian antiques, the establishment ensures that your stay will be a blend of elegance and relaxation. Each room features a private bath, cable television, complimentary Wi-Fi, and concierge service. The Architect’s Inn provides a scrumptious daily breakfast with a tasty mix of hot and cold items to start your day. You will love staying at an Inn, whose staff members are passionate about celebrating the Victorian era and its traditions. Located on historic Thames Street in Newport, the Francis Malbone House provides a luxurious bed and breakfast experience that will truly delight you. With 20 luxury rooms and suites, you are guaranteed to enjoy your stay. The establishment boasts carefully maintained private garden patios and common areas with Queen Anne style furnishings and beautiful rugs. 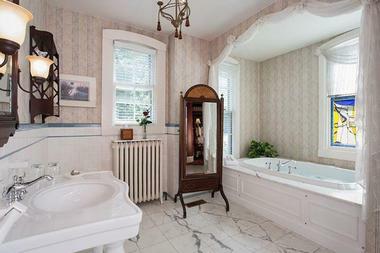 Many of the Victorian styled suites feature double Jacuzzis, fireplaces, and traditional furnishings and also include modern conveniences and amenities such as complimentary Wi-Fi access, iPod docking stations, fabulous toiletries, and plush robes. Savor the tasty homemade multi-course breakfast served in the dining room, which features a 15-foot domed ceiling and a cozy fireplace. To really appreciate the authentic Victorian era, you will want to take part in afternoon tea with delicious tea and amazing treats. The Adele Turner Inn is centrally located providing easy access to the beach, shopping, and opportunities for exploring the area and creating magical memories. This traditional Victorian bed and breakfast built in 1855 offers eleven beautifully decorated rooms with time period antiques and decor that allow you feel like you are actually living in Victorian times. Each morning, a fresh two-course full breakfast is freshly prepared and served to guests. You are more than welcome to spend lazy afternoons outside sitting at a table under the shade of the tall trees reading or napping. You will love the elegant and civilized experience of taking afternoon tea, which features a variety of hot or iced tea depending on the season, sandwiches, and tasty nibbles. Located on the historic Bellevue Ave in Newport, the Hydrangea House is within walking distance of the Old Quarter, which is renowned for its shopping, entertainment, and restaurants. This traditional bed and breakfast provides an ambience of sophistication and style through thoughtful details, careful design, and comfortable furnishings. The ten rooms pay homage the historical heritage of the mansion, and you will enjoy relaxing in your carefully arranged room or suite. Room amenities include flat screen TV’s, complimentary wife, iPod hook ups, and plush robes. Each morning, an exquisite breakfast of pastries, pancakes, egg dishes, or granola is served in the formal dining room. You will not be able to resist the homemade cookies baked and served daily.